The Maryland Department of Natural Resources sponsored a 2003 field test to assess the suitability of Reef Balls for catching a natural oyster spat set. The Maryland Environmental Service contracted the project and coordinated and managed the deployment. The original plan was to place 75 Reef Balls in the oyster sanctuary east of Point Lookout. Since this was a field test rather than a fishing reef, Tom O’Connell, MD DNR ‘s sponsor, accepted my suggestion as project manager for MES, to split the deployment between 3 sanctuaries, thereby increasing the potential for a natural spat set. This decision resulted in one of the alternate sites in upper Tangier Sound receiving a natural spat set. This video shows the first deployment trip off Point Lookout. The thriving oyster reef that subsequently developed at the alternate site is documented by a Chesapeake Bay Foundation video made a decade later that is on the CBF website. It was this reef, a field trial at the Horn Point oyster hatchery for hatchery spat sets directly onto Reef Balls, Reef Ball pour training and demonstration project sponsored by MES and the Oyster Recovery Partnership on Tilghman Island for the Tilghman Island Fish Haven, collaboration by MES and CBF for early Reef Ball pours for Maryland Bay waters, and success of Reef Balls with hatchery spat set at CBF’s Shady Side oyster hatchery with deployment at Hollicutts Noose Fish Haven, that were the foundation for the current use of Reef Balls for oyster restoration and fishing reefs in Bay and tributary waters. Recent Reef Ball reefs include 240 Reef Balls at Winchester Lump in the Severn River and Reef Balls that were poured at National Harbor and placed in Smoot Bay on the tidal Potomac. From Wade’s post on Facebook. a video at Chesapeake Bay Fishing Reefs on Facebook about the first deployment of Reef Balls in Maryland Bay waters. This Reef Ball project laid the foundation for today’s projects in Bay and tributary waters, including the Reef Balls that were poured at National Harbor and placed in Smoot Bay. I had the good fortune to direct the first placement in the video and participate as a volunteer for the National Harbor pour. The Louisiana coastline loses an average of more than 16 square miles of wetlands per year according to the U.S. Geological Survey. The Coastal Protection and Restoration Authority of Louisiana (CPRA) is the single state entity with authority to develop, articulate, implement, and enforce a comprehensive coastal restoration and protection master plan to reduce hurricane storm surge flood impact, restore Louisiana’s bountiful natural resources, build land to protect critical energy infrastructure, and secure Louisiana’s coast now and for future generations. 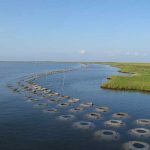 CPRA selected the Tetra Tech team to design a bio-engineered oyster reef demonstration project to show the potential of using reef breakwater product to combat coastal erosion in St. Bernard Parish. This project was funded through the Coastal Impact Assistance Program (CIAP) and is part of Louisiana’s Comprehensive Master Plan for a Sustainable Coast. The project is located in St. Bernard Parish’s coastal fringe marsh, which is susceptible to high rates of shoreline erosion due to wind-wave action. The project aimed to establish a living shoreline along 21-miles of coastal fringe marsh to dissipate wave energy before it reaches the shoreline thereby protecting vulnerable shoreline and the valuable marsh behind. The Tetra Tech team evaluated reef breakwater products to serve as a first line of defense for coastal marshes in the project area, helping to sustain the lower Biloxi Marsh. The project’s secondary goals were to allow sediment accretion between the shore and reef to create new land; stimulate oyster growth and increase the biodiversity in the immediate area; and provide CPRA with valuable data on the performance of various configurations of the selected products that can be used to design more effective projects in the future. Our team evaluated numerous living shoreline products to determine their potential to meet project goals. Products evaluated included A-jax, gabion mattresses, Reefballs, Reefblk, Hesco basket, and OysterBreak. The Tetra Tech team performed an environmental analysis of each product, including determining its ability to promote oyster growth, thereby increasing the biodiversity in the immediate area. Our team used analytical and numeric modeling to evaluate the shoreline response and performance of the alternatives using parameters including wave attenuation and sediment transport. The engineering and design of the project met all three project goals, and our team obtained all necessary permits on schedule to complete project construction during the grant funding period. Using living shoreline products to protect coastlines in Louisiana provides ecosystem services not available through traditional shoreline protection techniques. The products evaluated as part of this project will provide habitat for fish and other aquatic species, in addition to providing erosion control and shoreline stabilization. Project construction was completed in November 2016, and CPRA is conducting monitoring to evaluate the results of the living shoreline products’ performance. Dedication to 65 lost submarines. The first undersea memorial to these 65 lost submarines will be dedicated 27 MAY 2018 in Sarasota, nearly 50 years after loss of the USS Scorpion (SSN-589). Military honors will be given for the 65 lost boats and 4,000+ submariners at the On Eternal Patrol Memorial Reef dedication. We can think of no more fitting memorial to these heroes who made the ultimate sacrifice under the waves. These submariners will continue to serve and protect our marine environment for the benefit of future generations in the On Eternal Patrol Memorial Reef. Tomorrow marks 50 years since the U.S. nuclear submarine the USS Scorpion (SSN-589) was lost with all hands, 99 officers and crew, on 22 May 1968. She is one of 65 U.S. submarines that have never returned from duty since 1900. Representing more than 4,000 service members, these 65 boats and crews will be honored this Memorial Day weekend with full military honors at the dedication of the On Eternal Patrol Memorial Reef at 10 a.m. on Sunday, 27 May at Ken Thompson Park, 1700 Ken Thompson Parkway, Sarasota, FL 34236. The public is invited and many military service personnel and veterans are expected to attend. This first ever undersea memorial will be a collection of 65 Eternal Reef balls with plaques identifying each of the submarines still On Eternal Patrol and one additional Eternal Reef ball representing those crews and boats lost in non-sinking incidents. The 66 Eternal Reefs will be deployed to the ocean floor off the coast of Sarasota this summer to significantly boost the marine environment in which these submariners served and made the ultimate sacrifice. A reef ball is a designed artificial reef, specifically engineered to mimic Mother Nature and quickly assimilate into the ocean environment; new marine growth begins in as little as three months. The reef balls in the On Eternal Patrol Memorial Reef each weigh about 1,300 pounds and stand three feet tall. Full military honors will be presented on 27 May, including rifle salutes, buglers playing taps and an honor guard bestowing folded flags to representatives for each lost submarine. For many, this will be the first time they’ve been recognized collectively for their contribution and sacrifice. Dave Taylor, Past Commander Disabled American Veterans Chapter 97, will be the master of ceremonies at the dedication of the On Eternal Patrol Memorial Reef. Rear Admiral Thomas Logan Malone, Ed.D, U.S. Navy (Ret) will be the guest speaker at the event and Colonel Charles Caudill, U.S. Air Force (Ret), will be the officiating chaplain and offer the invocation and prayers. Students from Port Charlotte High School Naval Junior ROTC Unit will present the colors under the supervision of Cadet LCDR John Flaws. Additionally, middle school cadets from the Sarasota Military Academy Prep School(SMA) will be at the dedication ceremony as “cadet experts,” providing guests background on each of the lost 65 subs. The 72 sixth and seventh graders are supervised by Major Alex Vanston, USMC (Ret) and Captain Terri Davis, both military studies instructors at SMA Prep. Christina Bowman is SMA’s executive director of schools. A Sarasota-based 501c3 memorial organization, Eternal Reefs, Inc., has planned the ambitious project, in partnership with Reef Innovations and The Reef Ball Foundation. The On Eternal Patrol Memorial Reef has already garnered recognition from more than 25 states, including gubernatorial proclamations from Alabama, Delaware, Indiana, Massachusetts, Michigan, Nebraska, New Hampshire, New Mexico, Ohio and Wisconsin, to name a few. Submarine enthusiasts, veterans and other military representatives plan to attend from around Florida and across the United States. Brian Lawrence, a Navy veteran from Missouri, is attending in honor of RM2 Kenneth Eugene Nearman, who was aboard the USS TROUT (SS-202) when it went down on 27 February 1944 with all hands, 81 officers and crew. Lawrence shared that his late mother dated Nearman while in and after high school in Missoula, Montana and often spoke of him, and cried, well into her 90s. Michael Burasco, from Ocala, Fla., plans to attend to honor his brother, Nugent Anthony Burasco, who was one of 79 men lost on the USS Tullibee (SS-284) when she went down on 26 March 1944. James Jordan — who moderates the Facebook submariner group OTS at Crush Depth and served aboard on the USS Parche (SSN-683), the USS Daniel Webster (SSBN- 626), and the USS Sam Rayburn (SSBN-635) – plans to attend and be aboard his own boat to witness the deployment of one representative Eternal Reef on the reef site, weather permitting. View a video of the On Eternal Patrol Memorial Reef project, including a full listing of all submarines with their date of loss, on YouTube. Find a complete list of the 65 boats On Eternal Patrol and the boats lost in non-sinking events at http://www.OnEternalPatrol.com. Eternal Reefs is accepting outside funding to support the On Eternal Patrol Memorial Reef. Interested parties should call 888-423-7333 or email info@EternalReefs.com. The Genesis Reef Project dba Eternal Reefs, Inc. is a Sarasota-based non-profit organization that provides a creative, environmentally-enhancing way to memorialize the cremated remains of a loved one. Eternal Reefs incorporates cremains into a proprietary concrete mixture used to cast artificial reef formations which are then dedicated as permanent memorials which bolster natural coastal reef formations. Eternal Reefs pioneered the concept of reef memorialization and, since 1998, the organization has placed nearly 2,000 Memorial Reefs in 25 locations off the coasts of Florida (North Atlantic, South Atlantic, Gulf Coast and Panhandle), Maryland, New Jersey, North Carolina, South Carolina, Texas and Virginia, substantially increasing the ocean’s diminishing reef systems. Memorial reefs can only go in properly permitted locations by the U.S. Government. Eternal Reefs has strategic partnerships with the Reef Ball Foundation and Reef Innovations. The company secured 501c3 status in January 2017. Learn more at http://www.EternalReefs.com or on the company’s Facebook page. then return and plant marsh grass. June 2014—smooth cord grass being planted shoreward of reef ball breakwater. Photo by Lisa Laskowski. Shoreline degradation is an ongoing issue that challenges coastal habitat up and down the Texas coast. Shoreline degradation is the result of many issues, some manmade and others natural. Manmade issues include development, the creation of channels through sensitive marsh for commercial purposes, the Gulf Intracoastal Waterway (ICW), and others. Natural issues include consistent prevailing winds impacting shorelines, hurricanes, winter storms and other effects of Mother Nature. CCA Texas’s Habitat Today for Fish Tomorrow (HTFT) program has taken part in several projects that were implemented to protect eroding shorelines, re-nourish shorelines and to prevent the breaching of one ecosystem into another. These projects include a joint effort with Ducks Unlimited Texas and others for shoreline protection along the ICW in the JD Murphree Wildlife Management Area and along the ICW just north of the San Bernard River where important fresh water marsh lakes were being threatened by salt water intrusion from the ICW. CCA Texas also worked with Ducks Unlimited and others in Cow Trap Lake (Brazoria County) where marsh shorelines where losing ground to the elements yearly. Other efforts included those with TPWD in Bird Island Cove in West Galveston Bay and Snake Island Cove with the Galveston Bay Foundation (GBF), also in West Galveston Bay. The latest effort to help protect and restore shoreline degradation was recently completed on the far western end of West Galveston Bay along the Oyster Lake shoreline. This shoreline separates West Galveston Bay from Oyster Lake, a sensitive estuary lake accessible from the ICW and connecting creeks from Bastrop Bay. Over time, it is estimated that over 650 feet of shoreline has been lost on the West Galveston Bay side, and 150 feet on the Oyster Lake side since the 1940s due to prevailing wind, currents and hurricanes. Furthermore, the rate of erosion appeared to be accelerating, as since 1995, up to 175 feet of shoreline was lost on the West Bay side and 55 feet from Oyster Lake side. This project was a multi-phase undertaking that used different types of breakwaters designed specifically for shoreline protection and re-nourishment, and stretches across approximately 5,200 linear feet of critical habitat. Phase I of the project placed 950 feet of shoreline breakwater along the West Galveston Bay and Oyster Lake shorelines. Another 500 linear feet of reef balls were place along the West Galveston Bay shoreline in a 3-wide configuration, and an additional 450 linear feet along the Oyster Lake shoreline in September 2013. The impacts of the breakwater were seen quickly and between September 2013 and June 2014 in the natural deposition of 1,100 cubic yards of material accumulating behind the breakwaters, thereby triggering the rebuilding process. 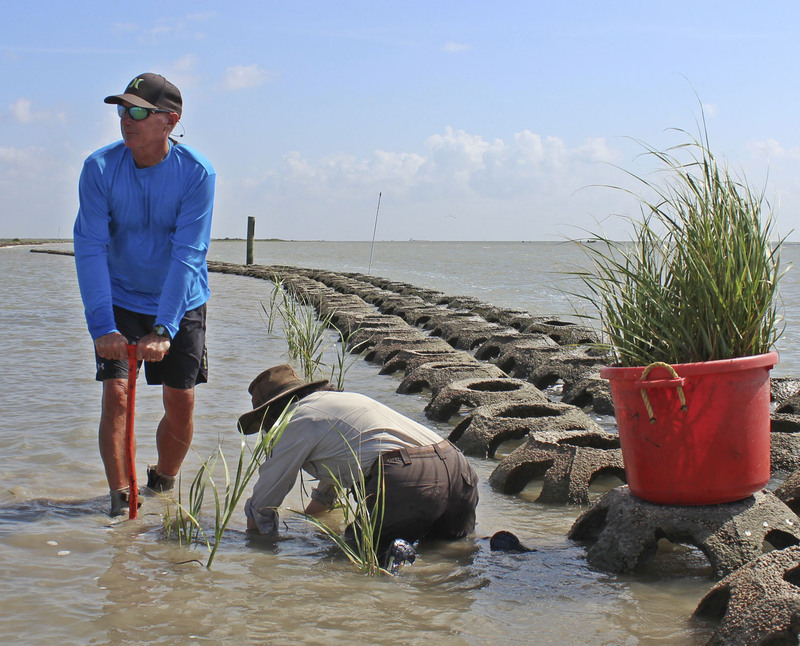 In June 2014, volunteers planted more than 2,000 smooth cord grass sprigs covering .75 acres in the area between the existing shoreline and the breakwater on the West Galveston Bay side. This cord grass was provided by project partner NRG and, since the original planting, the grass has been spreading and filling in the entire planted area. Phase II construction began in October 2015. This phase of the project utilized limestone riprap to form the breakwater. This breakwater was built in segmented fashion to allow water to flow freely in and out behind the breakwater and deposit materials that will eventually rebuild the shorelines. Phase II was completed in early January 2016 and 4,786 feet of breakwater that protects 5,150 feet of shoreline are now in place to protect Oyster Lake and the vital ecosystem services that it provides. The final steps in the project are to accomplish baseline data collection for annual monitoring and developing a grass planting strategy for the entire project. Partnerships are crucial in completing projects such as these and CCA Texas is proud to have been a part of the project through the direct contribution of $200,000. This was important as it established groundwork for GBF to secure another $270,000 in matching dollars. These funds along with other funds from project partners bring together many groups in the common cause to help protect and restore vital coastal habitat along the Texas coast. Project partners included Galveston Bay Foundation, CCA Texas, Ducks Unlimited, NOAA, Texas General Land Office, Galveston Bay Estuary Program, Texas Commission on Environmental Quality, National Fish and Wildlife Foundation’s – Gulf Environmental Benefit Fund, and US Fish and Wildlife Service. It is great to see Hernando County moving along with some great projects. Not all are big fish attractors but habitat for all the essential fish to help make the Gulf of Mexico a great system. Since 1990 Hernando County has been active in artificial reef development. Funding is provided by a combination of federal, state and local government, as well as private funds. This is done through the Division of Marine Fisheries Management of the Florida Fish and Wildlife Conservation Commission (FWC). The FWC assists in developing these reefs, enhancing existing reefs that are already successful and to monitor and assess artificial reefs. According to Frank Santo, chairman of the Hernando County Port Authority, there has been a a large grassroots effort by Hernando County which has had a huge impact on Hernando County’s marine system. These state and federal programs are driven by the recognition of benefits for commercial fishing and tourism. Commercially important fish and sports species are frequently attracted to the artificial reefs for the food source and shelter they provide. As larger fish species migrate through the area in the spring and fall the artificial reefs provide shelter, food and resting areas for such fish as albacore, king fish, Spanish mackerel and cobia. Artificial reefs remain very popular with the fishing public and contribute significantly to local economies. There are numerous considerations for artificial reef placement. Some individuals may be concerned that artificial reef structures may dislodge and be a detriment to the shore. According to research by Ryan Fikes Staff Scientist, with the Gulf Restoration Campaign National Wildlife Federation in an article in November 2013 titled Artificial Reefs of the Gulf of Mexico: A Review of Gulf State Programs & Key Considerations, artificial reefs need to be placed in clear shallow water with good light. “Water depth at the reef site may critically affect reef material stability and long-term structural integrity” when considering wave conditions. “The reef materials and designs should be properly matched to water depth and predicted wave conditions to ensure their stability. Planning for worst-case storms may need to be considered on sites where movement of materials would be detrimental or hazardous”. The reef material design needs to be matched to the water depth and predicted wave condition to resist breakup, movement or burial. Detailed engineering is important for the success of an artificial reef. There are few natural reefs in Hernando County and they tend to be over-fished. So artificial reefs allow distribution, growth, and protection of marine life. This relieves the pressure on the natural reefs. Due to the importance of site placement, careful planning and permitting is required as artificial reefs need to be placed near seagrass beds but have to be at least 150 feet away. Hernando County has a rich seagrass bed of 190,000 acres. The bottom is flat and sandy with seagrass interspersed between hard bottom areas. Hernando County seafloor has no structure only flat with occasional holes. Naturally occurring reefs develop over hard, rocky bottoms. Areas between natural reefs are often loose sand that supports marine grasses, such as eelgrass or turtle grass. The seagrass beds support many species and are important in the ecology of adjacent reef systems, providing foraging and breeding sites for reef fish. They provide food, habitat, and nursery areas for numerous vertebrate and invertebrate species. They are the ideal environment for juvenile and small adult fish for escape from larger predators. Many small organisms live in the soft sea bottom like crabs, clams, and starfish for protection from currents. Initial monitoring of new artificial reefs which are placed near seagrass indicate after testing of the first week, there are already juvenile grouper living on the reef. Much research has been completed internationally in regards to the benefits of artificial reef development. Researchers Gary M. Serviss and Steven Sauers, who were the principal investigators in a detailed research article published in 2003, Sarasota Bay Juvenile Fisheries Habitat Assessment, proved positive impact of these reefs. Although they found the natural reef sites had a higher density of resident and transient species, the artificial sites had a slightly higher mean density of nursery fish. Monitoring indicated that the habitats are doing fairly well when compared to that of the natural habitat types. Their research found that many of the reef-dependent species such as tomtate, gray snapper, and gag grouper were observed and this also held true for the commercially important stone crab. The researchers also found that the diversity of the species tended to increase with the complexity of the material. More crevices provided more safety from predators. Also, the older the artificial reef the higher the diversity of adult fish and fewer juveniles. They found the less uneven surfaces like “concrete block, generally did not provide the number of protected spaces needed for some of the species to successfully habitate. This material type generally had low numbers and low species diversity. However, increasing the complexity of a concrete block pile with the presence of reef balls greatly improved the diversity and numbers of fish species present.” This resulted in a wide variety of different species with four size classes, from the early juvenile stage of some up to the largest adult stages. Mr. Santo stated that initially there was not much interest in the community for these projects, but now our county administrators have realized these artificial reefs have increased tourism and have had a sound environmental impact. As a result, Hernando County is getting respect among fisherman and the state for the advancement of protecting and enhancing our very important marine system. There are currently a number of artificial reefs in Hernando County which include but are not limited to, Bendickson Reef where there are 10 M60 army tanks placed in 1995, these are now overgrown with sea and fish life. Permits were recently approved and an additional 600 tons were added to the reef. Monitoring will be provided by FWC and Florida Department of Environmental Protection (FDEP), and US Army Corp of Engineers (ACOE). The Florida artificial reef program is the only state program that is not exclusively run at a state agency level. FWC depends on its partnership with local counties to hold reef permits and manage new reef deployments. Another artificial reef is reef project #1 which is a shallow reef project with 130 reef balls in 3 different spots. These aHre carefully researched locations. Monitoring is planned for April 15th by the Scubanauts, who are coming to assess the fish populations and new life growing on the artificial reef. The Scubanauts are students in a marine science education for young men and women, ages 12-18. These young marine scientists receive informal science education through underwater exploration focusing on diving experience, and personal development. Hernando County is fortunate to have these young scientists available to assist our community in our marine research. Hernando County is also in the process of investigating 20 different sites where the next batch of material will be placed. The reef ball material is available and site planning and permitting is ongoing. Permitting is the responsibility of the ACOE in federal waters and by both the ACOE and the FDEP in state waters. Both agencies work with the FWC during the artificial reef application process. Sponsorships are now being offered through the Hernando Environmental Land Protectors (HELP). HELP is a not-for-profit corporation created in 1976 and is one of the oldest established environmental organizations in Hernando County. Through this organization, an individual or business can sponsor a reef ball. The reef balls will include permanent commemorative plaques and the location coordinates will be provided to the sponsors so they may visit their reef in the future. The sponsored reefs will also provide educational opportunities, as well as great fishing spots. All deployments will be monitored by Scubanauts International and data analyzed by the students of the University of Florida and other research institutions. Artificial reef projects are monitored by a variety of sources such as the Scubanauts, and sonar imaging of the seafloor and remotely operated underwater video. These assessments include fish censuses and mapping, reef spacing and design, material stability, storm impacts and comparisons of artificial reef fish communities with those on adjacent natural reefs. Approval has also been received for development of an oyster reef and habitat restoration project in Centipede Bay. Research has proven that placement of oyster shell in bags will stimulate the growth of juvenile oysters, improve water quality and reduce shoreline erosion. On March 11, community volunteers loaded bags of specially processed and disinfected oyster shell to be returned to the sea for oyster regeneration. This was sponsored by UF /IFAS extension. Oyster beds are dying in the state of Florida because of freshwater intrusion and lack of nutrients. Hernando County has a rich area of nutrients. The tentative launch date for the oyster beds is April 2018. Florida is responding to fisheries and habitat decline with one of the nation’s most progressive artificial reef program, with Hernando County being one of the leaders in the state.